You’ve chosen the wine you want to craft and now you’re going to begin the actual production process. Don’t worry – it isn’t difficult at all and we have very experienced staff to help you through the process. We start by preparing our primary fermentation vessel, A.K.A. the fermenter. At Steveston Winemakers we use food grade liners to ensure a clean environment for the fermentation to begin. The fermenters are thoroughly cleaned after each use and are stored with a solution of sulphite in their base. We recycle the sulphite solution into the bucket in the sink where we sterilize our mixing tools. We take care not to inhale the fumes directly, unless we need our sinuses cleansed. With the fermenter placed on our electric lifter and fixed with a fresh liner, we add 1 to 2 inches of water. Into the water we carefully shake the bentonite and swish it in the fermenter until it is dissolved. For this journey we’re going to use one of our most popular red wines, which has a variety of ingredients. Different kits have different ingredients so the next steps will vary, but not by much. Included in this kit is a sock, much like cheesecloth, which will help keep all of the loose bits together, making future steps a lot easier. The sock is stretched over the mouth of a small mixing bucket and then we add the ingredients. In this kit there are packages of oak chips which go in first. Next is a bag of delicious dried grapes. Once the contents for the sock have been placed in the small bucket we tie it up, leaving a lot of empty space, before cutting off and recycling the remainder. We carefully lower and dump the sock into the fermenter. The small bucket is rinsed and added to the fermenter. Next comes probably the most difficult step and that is pouring the juice concentrate from the bladder into the fermenter. Keeping the fermenter below the counter helps a lot and so does experience. Once the bladder is empty, we rinse it twice, pouring the contents into the fermenter. All non-dessert wine kits start with 23 litres so every bucket is marked at the 23 litre level. We must now add water to the fermenter up to the appropriate level. When there’s a wet grape pack in the kit, we add another inch of water. It’s now time to give the contents a good stir, being extremely careful not to rip the bag. This is best accomplished by not letting the stir spoon touch the bottom or the sides. Remember if the grapes are from down under to stir counter clockwise. Once everything is mixed it’s time for you to sprinkle the yeast which will immediately start to work consuming sugars and producing alcohol. We place the lid firmly on the fermenter and use the electric lifter to place it on a top shelf. Because this kit has grapes it will be receiving some extra attention. 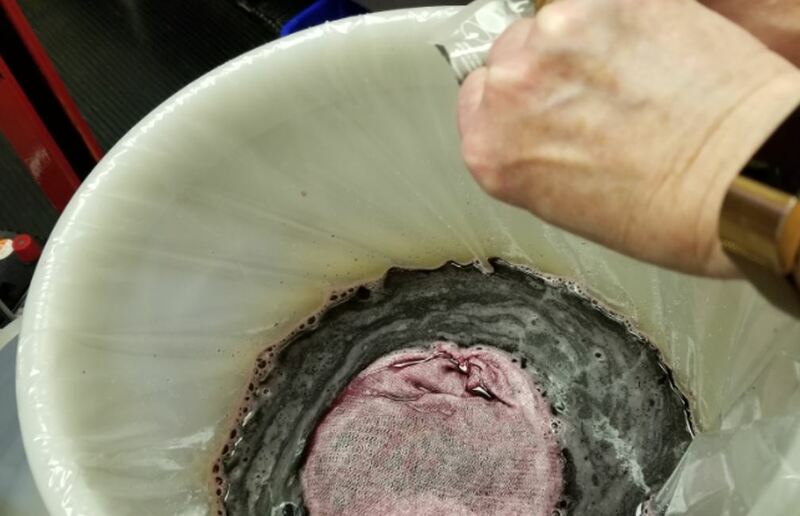 The grapes will float to the top, causing a seal and blocking the air so the staff “punch down” these kits daily to ensure fermentation proceeds properly. All of our wines are in the primary fermentation stage for 14 to 16 days when, under normal circumstances, the wines will have reached the appropriate specific gravity. If not, our staff will take appropriate steps to help the wine get to the right place. This could include adding more yeast or leaving it for a few more days. This rarely happens, in fact I have yet to see anything more than an extension of a couple of days. I’ve put together a short video that shows Step 1 in action. Click here to watch it and enjoy! Next month’s topic will be about Crafting Your Wine Step 2 – Racking.